Alexander Dynkin, the head of the the Academy’s Department of Global Problems and International Relations, said today that he had nominated Kissinger himself. He dismissed Kissinger’s political record, claiming that wasn’t considered in his election. According to Dynkin, there was a majority of 11 votes in support of Kissinger at his Department. The Academy’s press office said Kissinger’s nomination had been accepted by a majority of the Academy’s 1,125 voting members. Another academy source said that once Dynkin had won the vote for Kissinger at his Department, the Academy vote was a rubber-stamp exercise. No opposition to Kissinger has surfaced publicly among the Academy’s Russian members. The public announcement of Kissinger’s election has not yet appeared on the Russian Academy’s website. The news was released on October 28 by Academician Boris Chetverushkin (below, left), a mathematician. He read out the results of the Academy-wide ballot, which included several other new members. The Department of Global Problems and International Relations is headed by Dynkin (above, centre), an economist, and by Anatoly Torkunov (right), head of the department’s Section on International Relations. The Academy headquarters in Moscow has been a well-known monument of late Soviet modernism. Altogether, there are 1,125 members elected to the Academy. Of this number, the Academy currently lists 475 foreign members, so almost one-third of the full membership is not Russian. Kissinger’s election is so new, there hasn’t been time to induct him officially or put his name on the Academy’s foreign list. The Academy is organized into 13 departments by their scientific or academic specializations. The presidium, headed by Vladimir Fortov, manages the entire structure, with several dozen academician members, senior academic advisors and junior administrators. The Department of Global Problems and International Relations is one of the 13 departments. It in turn incorporates 9 separate institutes for international economics and regional areas, such as the US and Canada, Europe, the Far East, as well as some other academic groups. The department is also heavy on administration. 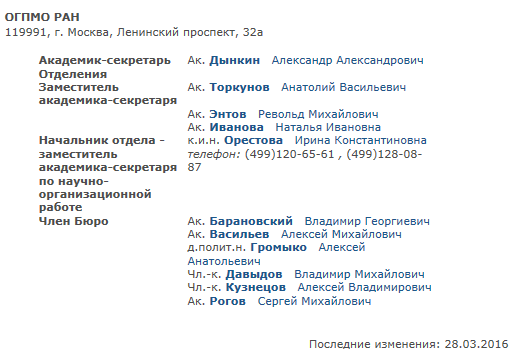 Its bureau (in Russian, Отделение) or control committee numbers 10 academicians, plus Irina Orestova, a deputy academician who is titled the bureau’s “secretary for scientific and organizational work”. Orestova said the process of election started four months ago, and she could not remember the details. She did remember there was a majority of the 11 members of the department bureau voting for Kissinger. Under the department’s bureau, the Academy lists a total of 31 individual academicians whose seats are arranged into two separate sections – one for global problems, one for international relations. Here is the list for the Section on Global Problems, which is headed by Revolt Entov, an economist specializing on state finance and budgeting; this section has included no foreigners to date. Until Kissinger’s election on October 28, there were 15 members of the Section on International Relations, headed by Anatoly Torkunov. He had a diplomatic posting to the Soviet Embassy in Washington during the 1980s. He has also been a university administrator in Moscow, and an academic specialist on East Asia. In 2010 he was awarded the Order of Merit of the Republic of Poland. According to Dynkin, Kissinger was accepted by a majority of the 11 bureau members; then cleared by a committee of 10 experts; and finally voted by a majority of the full Academy membership. Dynkin said that when the Academy votes on Russian candidates, an exact tally is kept of the votes for and against. But for foreign candidates, according to Dynkin, there are “no precise data about the number of persons who voted for and against each foreign candidate.” He confirmed there had been votes against Kissinger, but no official record of how many. Dynkin and Orestova also confirmed that two other foreign candidates had been nominated and accepted by their department. One is the US economist and Nobel economics prize winner in 1972, Kenneth Arrow (below, left) , whose last academic appointment was at Stanford University. Arrow has been assigned to the Section on Global Problems. Also running alongside the Kissinger candidacy was Enrique Iglesias (above right). Iglesias is well-known in Uruguay, where he has been an economist, head of the local central bank, the Uruguayan foreign minister, and then head of the Inter-American Development Bank, whose control shareholder is the US. Iglesias is currently a member of the Global Leadership Foundation; that’s a Swiss-based group funded by banks and mining companies. The “global” part of this organization’s title includes representatives of the US, Australia, Canada, Sweden, Latvia, and Finland. It excludes China, Russia, Germany, and Japan. 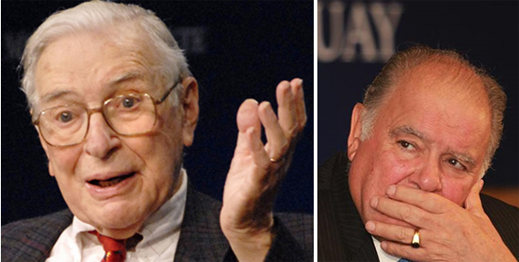 Dynkin and Orestova say that majorities of the department’s bureau voted for Kissinger, Arrow and Iglesias. An unconfirmed source indicates that Kissinger drew 6 out of 11 votes. The Academy’s press office confirms that all three have been elected by majorities of the full membership. 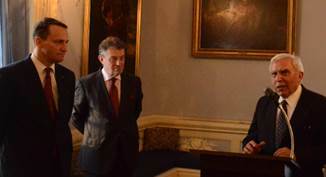 Torkunov’s international relations section already includes three foreigners – Gerhard Schroeder (below, left), Thierry de Montbrial, (centre), and Adam Daniel Rotfeld. Schroeder was Chancellor of Germany between 1998 and 2005, representing the German Social Democratic Party. Montbrial is a US-educated economist, who ran a policy staff for the French Foreign Ministry and has gone on to work for a number of French corporations, as well as several US-controlled think-tanks – the Peterson Institute, Carnegie Moscow Centre, and the Stanford Institute for International Relations. For his current line on the war against Russia, open this archive. Compared to the German and the Frenchman, Rotfeld is more hostile to Russia. He was closely connected to the Polish Foreign Ministry when the minister was Radoslaw Sikorski (right, with Rotfeld, far right); according to a Warsaw political analyst, Rotfeld “was an eminence grise at the MFA during the Sikorski years.” For a time, Rotfeld and Torkunov worked together on the Polish-Russian Group on Difficult Matters; one of the issues was the Katyn massacre of 1940. One outcome of their work was this public acknowledgement from then-Prime Minister Vladimir Putin on the 50th anniversary in 2010. Since the start of the NATO war against Russia, and the opening of the Ukraine front in 2014, Rotfeld has joined Sikorski as an advocate of anti-Russian policies, including regime change in the Kremlin, sanctions against Putin, and NATO reinforcements of Poland and the Baltic states. Rotfeld has resigned from the Polish-Russian Group. “[Rotfeld] is an opportunist switching allegiances depending on the external environment,” according to another Polish source. The Academy’s foreign members did not vote on Kissinger, Arrow and Iglesias. According to Dynkin, the nominations were not intended as a three-way contest. Once Dynkin’s and Torkunov’s bureau had decided on Kissinger, and his academic record cleared the Academy’s expert committee, the election outcome was sealed. Kissinger has become a Russian academician in the dark.